Reading is one of the best hobbies (if not the best), and one should possess it. Finding quality reading material and reading it thoroughly on regular bases makes one wiser. It opens the treasure of knowledge which no one can steal from you. 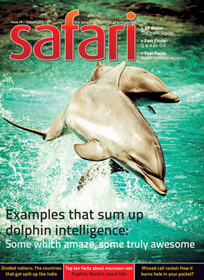 Safari – is one of those magazines which are worth reading. More important then the price of the same, it gives you fantastic return of the time you spend reading it. Let us check the January 2014 issue of the magazine and what it has between the cover to offer you. The cover page with the photo of a long neck dinosaur on the cover page with the title How did the colossal dinosaurs get such long neck? gives us a hint to expect a detailed article about the same. The colors of cover page are attractive but the dinosaur shown is looking like a 3D model created using a computer software. It could have been worked better to look even more convincing. 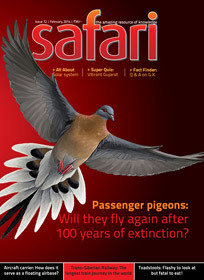 And yes, the article tries answering the question mentioned on the cover page. We also wonder why species like herbivorous dinosaurs manage wandering using (and mainly why they need it) such a long neck (it is roughly 6 times than that of giraffe). How the nature prevented the neck from being broken or damaging other parts of the body are also interesting facts to know about. It is a 7 page detailed article which is full of illustrative images and informative facts. Good to go for it. Do you think to live without food? Well, we are not talking about some sages, saints, yogis and similar. We are talking about common man. Some people even go for vitamin pills, protein bars and other health supplements. The word supplement is important here (it is not a replacement). Have you heard about Soylent? In the form of a thick shake it serves the ingredients which you get from a conventional diet! Some people started using it as an alternative of food! Want to know more about it? There is an article for the same in this issue. India possess a large amount of seashore and to guard the same, battleship and floating aircraft careers are – a must. After so much wait, finally – INS Vikramaditya – have joined the Indian navy and the role of the force multiplier is expected from the same. It would be interesting to know its features in an article inside this issue. We are also curious to know the details about the ship because it was launched to serve the Russian Navy in 1987 (with the name – Admiral Gorshkov). Does the age of so many years made it outdated? Or the renovation and implantation of the latest technology made it more deadly? The answers are expected from the article inside. The 6 page article provides really detailed information. It is important to know about these species, but it will appeal more to those who are bird-lovers or care for environment (actually we all should). Actually article deserves to be detailed though. An article giving us information about the background and invention of these stuffs is really interesting and we would suggest you to go for it. How do migratory birds manage to fly non-stop all the way to their breeding ground thousands of kilometers away? How does blood of some animals have color other than red? What is Eau de Cologne and how does it differ from regular perfume? Why is the sky blue and why are sunsets red? What is Chandrasekhar limit limit as applied to the fate of stars? How actually big is the biggest submarine constructed so far? How does the underwater diver’s breathing device aqualung work? Before the fruit was discovered, what was the color “orange” known as? How soon will Italy’s famous Leaning Tower of Pisa fall down? Why are tomatoes always red?Which chemical makes this color? How long is the longest solar eclipse? This time this section contains more detailed answers and each of them contains illustration or photograph as the part of explanation, a plus point. As the winter started showing its attributes, the Super Quiz section focused on the – Cool Facts About Winter – is quite on time and interesting. You should read this section for sure. Google Glass is one of the most talked about project with technological advancements. 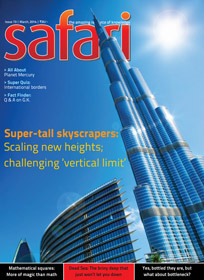 The last cover page of this issue brings in a very detailed article about this future gadget. The information is given in very simple language. Overall the issue worth a read. It is a good option to start the new year with.